If you’ve never come across Sorted before, I highly recommend it for recipe and cooking tips. Sorted started as a group of lads in London posting YouTube recipe videos teaching their audience and initially each other how to cook. Their YouTube channel has now grown into a ‘global food community‘ with hundreds of free recipes available online they’ve also got a few cookbooks under their belt, a product line and have done numerous collaborations with celebrity chefs and well known personalities. I often find myself heading to their website when I’m looking for something a bit different to cook, a bit of inspiration away from my usual favourites. The Boyfriend is a huge fan if tuna and on previous attempts to cook it at home we’ve slightly over done it or not seasoned it well enough and it’s been a bit bland. So in an effort to cook him one of his favourite foods I turned to Sorted for a bit of help. 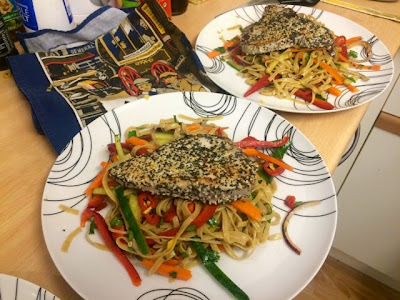 I got most of the ingredients for this dish in the local supermarket, however I did have to go to a specialist Thai supermarket to get the wasabi paste to spread on the tuna. I am however, pretty sure you can get this in most supermarkets, they just didn’t happen to have it in the one I went to. Taking advantage of my trip to the Asian supermarket though, I did take the opportunity to get some proper Thai egg noodles for the dish just to make it a bit more special. If you do have an Asian supermarket near you, it is well worth a visit just to take a look at all the weird and wonderful things they stock. This is a ridiculously quick and easy dish to cook, proving that you don’t have to spend loads of time in the kitchen to make a really exciting meal. Both the noodles and the tuna will cook in a matter of minutes, so unless you’re really really slow at vegetable chopping you can easily have this on the table in less than fifteen minutes! Both The Boyfriend and myself really enjoyed this dish and I’m definitely making it again. The only difference I’ll make is to be slightly more liberal with the wasabi paste, I’d not used it before and it has a reputation for being really hot so I was a little shy on how much I used and it definitely could have done with more of a kick. Click here for the link to this recipe.